Recently, the Association of Legal Administrators (ALA) commissioned InsideLegal's Jobst Elster to conduct a follow-up to his "Getting Comfortable in the Cloud" cover article featured in the May 2015 issue of its member publication, Legal Management. In the October issue, Jobst has a virtual 'sit down' with Rick Varju, Foley & Lardner's Director of Projects & Infrastructure Operations, to discuss the firm's strategic stand on cloud computing and talk brass tacks about some of the specific cloud technologies the firm is currently relying on and rolling out in the future. Foley & Lardner has been moving closer to a 'cloud first' approach ... "Today, more and more of our new tech discussions start off with a focus on whether cloud-based offerings can be leveraged." Cloud-based services the firm currently leverage include NetDocuments document management; Chrome River expense reporting and invoicing; Meeting Room Manager conference room scheduling; Absorb Learning Management System for internal training delivery; LexisNexis eBooks legal library online; Vuture marketing communication automation; and Proofpoint for spam email filtering. Larger cloud service providers can offer greater levels of security for a firm's data than they can themselves. Agility and the move to more of a consumption-based usage model are also very attractive with the cloud. Having the ability to easily and quickly grow or shrink cloud app or service usage as needs change, can be both cost effective and extremely advantageous, especially in M&A-type situations. In the 2015 ILTA/InsideLegal Technology Purchasing Survey we asked ILTA member law firms to list technology consultancies they work with. Given that 92% of respondents indicated using outside consultants, we anticipated an interesting, yet telling response pool. The official question asked: "What national/international technology consultants have you worked with?" Note: This question addresses which consultancies ILTA member firms have worked with only. It is not an endorsement or ranking based on service or quality of experience. The open-ended question yielded mentions of 96 consultancies (all listed below), but these first four consultancies received the most mentions by far, at least 7 each. Content wise, LTNY 2015 is heavily focused on information governance (IG), risk and compliance... particularly as it relates to eDiscovery, corporate security and information management. We heard it last year but this year it is loud and clear.. IG is no longer a sideline, add-on activity but a broader strategy of managing information overload. The time to simply check off IG and compliance tasks is over. So what happened to big data? I thought it was bigger than ever? Yes, but we are seeing two distinct trends ... 1) Big data is being rolled into IG, risk management and information management themes as opposed to positioned stand-alone and 2) analytics, a hotter than ever topic, is essentially a big data off-shoot. Case in point, the 2014 ILTA/InsideLegal Technology Purchasing Survey revealed that over 50% of responding ILTA member firms would use analytics as a primary big data technology. Considering privacy and security are on everyone's 'major challenges' and 'top priority' lists, the topics themselves are somewhat downplayed. We suspect these topics are central to most information governance discussions which seem to be dominating this year. Last year we asked "where did the big pricing discussion go? Remember AFAs?" Session wise, LTNY seems to have moved on, although we did notice an increase in cost-related themes and sessions. Based on our five year comparison, the 2015 LTNY cloud has by far the most government focused content. IG, information management, compliance and increased regulations are all intertwined with government so this trend adds up. 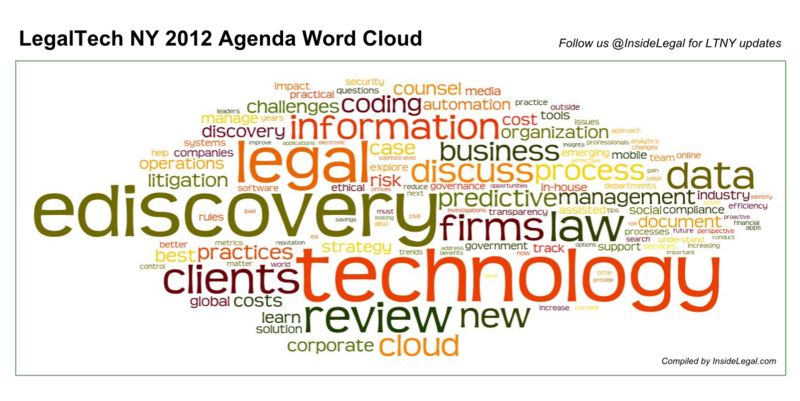 As a comparison, we have included the LTNY Agenda Word Clouds from 2014, 2013, 2012 and 2011. Subscribe to InsideLegal for LTNY updates and market information and follow us on Twitter at @InsideLegal for timely updates. 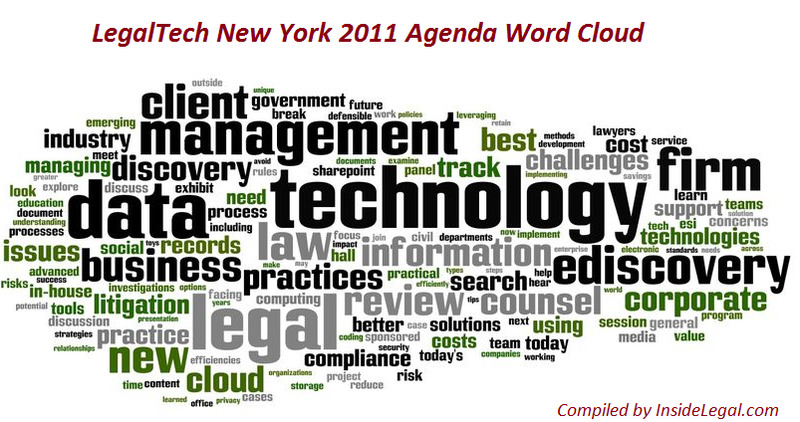 The word cloud was pulled from the agenda listed in the LegalTech NY Show Brochure from www.LegalTechShow.com. On Tuesday night, August 19th, the ILTA Communtiy (and all friends, followers and supporters in Nashville for ILTA 2014) announced and celebrated the winners of its annual ILTA Distinguished Peer Awards. Here's ILTA's official press release. Congratulations to all recipients and alumni. (Nashville, TN, August 20, 2014) The International Legal Technology Association (ILTA) held an awards dinner on Tuesday evening, August 19, in conjunction with their annual educational conference, ILTA 2014, held in Nashville. The recipients of the 2014 ILTA Distinguished Peer Awards were announced and celebrated at the event. This was the fifth year of the annual awards program, and the association was pleased with the number and diversity of nominees across several categories. ILTA’s Distinguished Peer Award program recognizes premiership and provides a forum for peer-nominated, peer-judged innovations in technology and leadership in several categories. Deepak Massand of Litéra Corp.
For more information about the Distinguished Peer Award program, please visit http://awards.iltanet.org/. For more information about ILTA, visit www.iltanet.org.